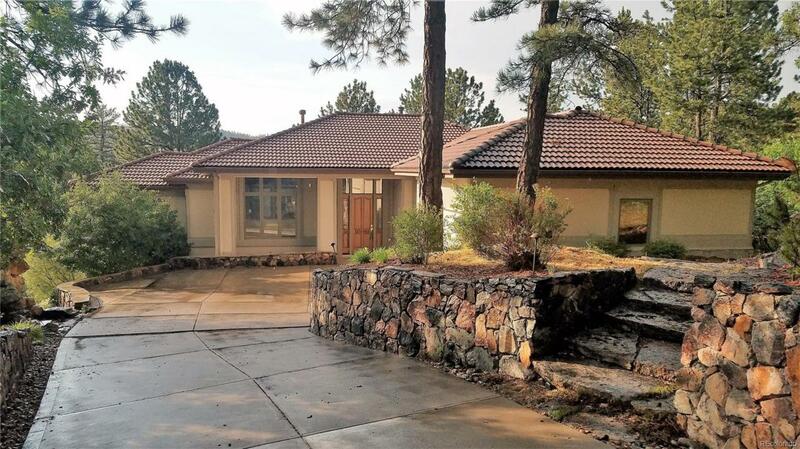 Welcome to this extraordinary Mountain Contemporary Custom Ranch home that lives like a two story in Castle Pines Village. Beautiful views from every window! 12' ceilings & 9 windows.Be pampered in the master suite with his & hers walk-in closets, 5 piece spa-like bath with Jacuzzi tub & deck. Gourmet kitchen. Beautiful main level deck with views of Cherokee Ranch. The main floor office features built ins, large working space and a private deck. The lower level draws friends & family. The great-room includes 12 ceilings, gas fireplace, huge windows and amazing views of the woods, fire pit, pond and water feature. To complement this amazing lower level: 2 additional bedrooms, full Jack & Jill bathroom, movie theater/media area, billiard/rec room with wet bar. Walk out to the gas fire pit, pond and a cascading water fall feature that wraps around one whole side of the home. Spectacular scenery from every room. Top of the line fire and security system, heated driveway & a 3 car garage.